One of the most anticipated design books of the fall is finally out – Decoration by Stephen Sills. 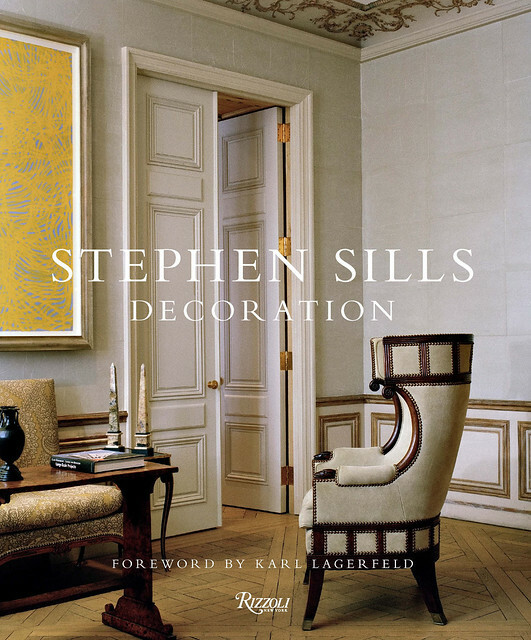 Sills is one of the legends of design, a member of Architectural Digest's AD100 and one of AD's "30 Deans of American Design", and has recently been included in Elle Décor’s A List of the Top 25 Designers. His first book Dwellings (which he co-authored with James Hunniford) is in the reference library of my designer and architect, and I referred to this book quite a bit during my house build. Stephen Sills’ new book Decoration showcases his solo residential work, and is a much bigger book both in size and scope. It is exceptional – destined to become another design classic. One of Sills’ signatures is the way he mixes cultures and pieces from different centuries so that they seem to speak to one another. His designs are simultaneously classical and contemporary, layered with tranquil hues, unusual finishes, dramatic modern art, and museum-quality furnishings. Filled with luxurious fabrics, furnishings from across centuries, and unusual finishes, his work is polished and seemingly effortless. The title of the book is so simple, but Sills’ work most definitely is not. It is nuanced and layered, and he has reached a level in his career in which his clients have the budget and the resources to create the most wondrous residences in the world, both from a décor and architectural perspective. Sills’ projects, each and every one, are beautifully crafted and filled with treasures and exquisite details. He is also particularly adept at creating magnificent architectural envelopes with the floors, ceilings, and walls that add a unique third dimension to the spaces. Here are some of my favorite examples of his work from the fourteen residences that are featured in the book. All images are used with permission. © Stephen Sills: Decoration, Rizzoli New York, 2013. Photographer: François Halard. The cover is an excellent introduction to the caliber and quality of the work contained within. The decoration is always an important element, but the architecture and treatment of all of the surfaces is equally important (in fact, there was a point when reading the book that I checked to see if Sills is an architect as well as a designer, as there is so much detail about the architecture of the spaces as well as the décor). Stephen Sills is known for his one of a kind wall treatments; this wall was created with a celadon paint, then very thin layers of tissue paper were layered on top, creating a “beautifully translucent, very fragile effect”. 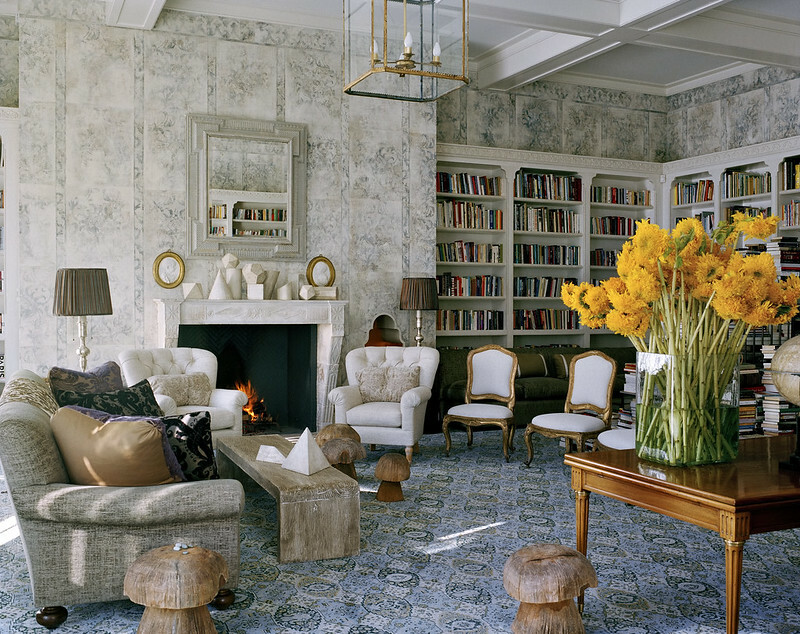 Many other details of this room and the entire Fifth Avenue apartment are in the book. This room from a house in Connecticut caught my eye. The goal was to create a magical house for a young family of avid readers – note that the bookcase is full of books (and only books). It seems that most of the rooms in this house contains bookshelves full of books – a great thing to behold. The walls are stenciled burlap. This is the type of room (and picture) that you could look at a thousand times and see something different every time you looked. 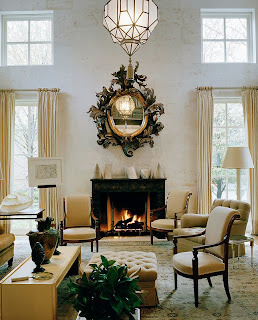 I included a picture of this room in my last post on French style mirrors, and it was this room inspired the the post in my mind as I was so taken with the mirror above the fireplace. I also love the custom banquette, a novel solution to furniture layout in a square room that allows both sides of the room to be used, and the placement of a central light fixture. It’s in a historic building in New York City that was completely renovated, but the original classicism was retained – as Sills writes, “I believe successful modern living can be achieved in classical backgrounds”. Here is a close up of the mirror. Sills writes “contemporary furnishings against an antique neoclassical background set the mood to reflect how we live today”. A light filled library in a newly built house in Tulsa, Oklahoma (Stephen Sills’ home state). The client wanted high ceilings and not many rooms, so much care was taken that each room was extraordinary. The mirror above the fireplace is Roman, and the mantel is bronze. Note the light fixture. Sills says that light fixtures can lift a whole room up. In Sills words, “Lighting fixtures are among the most important accessories in a house. They’re the ones that matter. I’d much rather have a really beautiful light than a bunch of knickknacks on a table”. The living room in the same Oklahoma house. I always enjoy seeing how designers at the top of their game decide to arrange the furniture in a space as large as this one. Here, the eye is drawn to the magnificent fireplace with the beautiful tall mirror and art work flanking the fireplace (one of which is a Rothko), and the glorious 17th century Venetian rug (which mimics the mosaic stonework of the floors of Venetian palaces). Sills notes that the rug, although an antique, provides such a modern touch to the space. 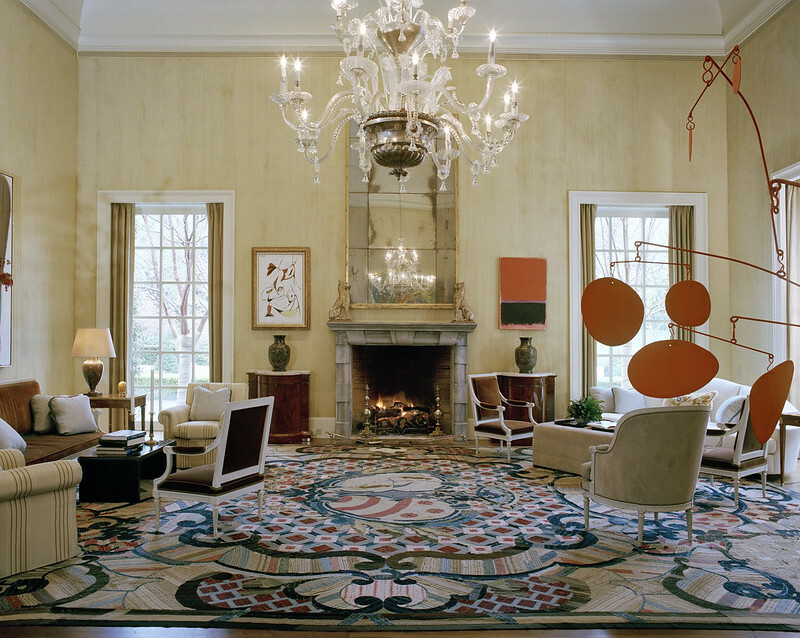 A mobile by Alexander Calder can be seen on the right –additional pages of the book show the other side of this grand room, which has an fantastic, enormous Joan Mitchell painting (not included in this post, you will have to see it in the book!). I saved my favorite image for last. I mentioned that many of Sills projects include treasures. 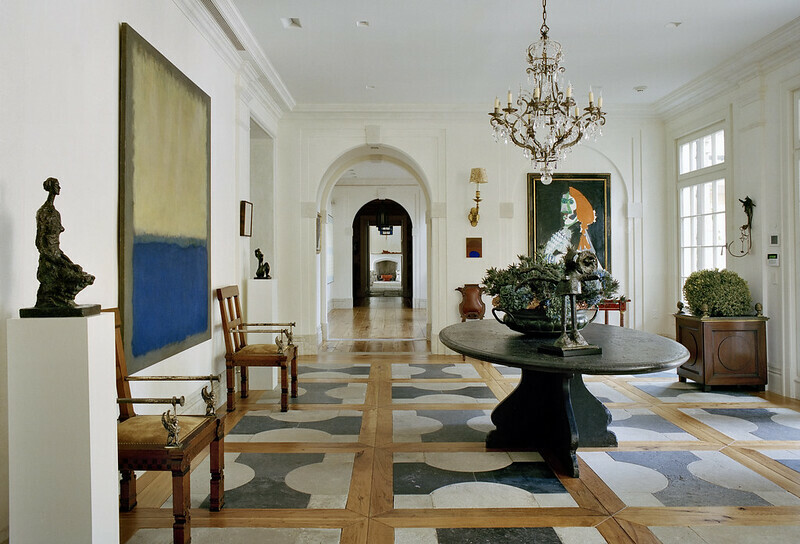 Take a look at this room: on the left is a Rothko (and a beautiful one at that); on the right is a Picasso. The chandelier is an exquisite piece, an 18th century bronze and crystal design. The center hall table is a 16th century Spanish monk’s table (I love the casual tilt of it in a room of such exquisitely constructed design). Sills noted that the floor, made of wood and stone, was the subject of his dreams. In fact, he woke up one night in the middle of construction of the house, and wrote “it came to me that the black keys the middle of the squares needed to turn in alternating directions, so I had the whole thing redone”. It’s that kind of attention to detail that makes a space great, and I am not surprised that the title of the chapter that this house is in is called “A Designer’s Dream” – which has clever meaning on two levels. I highly recommend Decoration by Stephen Sills – it is a beautiful, high quality book inside and out, with fourteen houses (one of which include the landscape design too) featured in great detail with superb photography. Each one is different, and is filled with nuances in both design and architecture that will make this a book that I return to again and again as reference. When looking at the pictures and the exquisite design in each space, I get the feeling that I am looking at a beautifully composed work of art. Have you ever felt that way while looking at certain designer’s spaces? Decoration can be found on Amazon here; I am not surprised to see that it is the #1 book in interior design right now as I write this post. Have you read the book? What do you think? Do you have a favorite room? Thank you for this post. I was not familiar with Stephen Sills. What an eye! Just this small selection of photos is so revealing. I was struck first by the careful repetition of shapes. In the first photo - the squares on the back of the chair mirroring the door and wall panels. In the 3rd and 4th pictures - the repeating round shapes and curved edges. So beautiful!! Okay... I have a mixed review here and I hope its okay to state some things that are bothering me. Its not a reflection on you at all I adore your blog and your taste! First of all... Stephen Sills was one of my interior design gurus 25 years ago when I was first a student in design school. I absolutely adored everything he did and was blown away, continuously by his exquisite use of color and oft-unique, but classical furnishings. The color, he still has--- in spades. 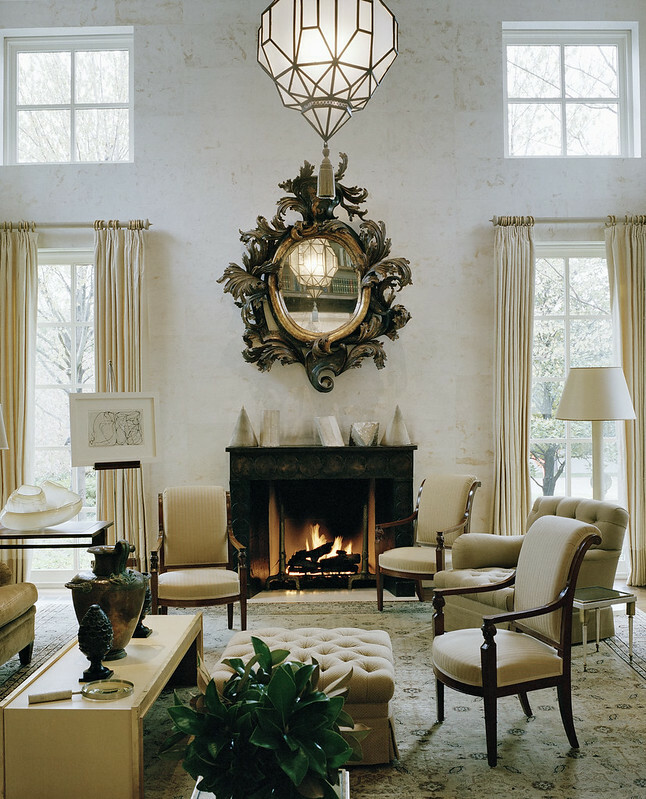 The French mirror over the fireplace is sublime. This is a home on a very grand scale and what I also love is that he didn't feel compelled to put in a bunch of over-scale furniture. Where I'm having a problem is in some of the furniture choices and some of the placement which appears like they were just dumped any old place. (note the photo with all the chairs and then an ottoman with a plant stuck in front of it and then a coffee table. bizarre. and what's the ugly round brown thing?) they happened to land and then the photographer came in and shot it. I find it disconcerting and not interesting, but weird, like he's trying too hard to be different, but its not really working, IMO. In some photos, it feels like the room isn't finished, or that they had to make do with what they had. What's with the round end table with a lamp next to the fireplace? I could keep going, but this is already pretty long. I don't feel that he's at the top of his game, but has slid into something that's neither here nor there. While there are elements that are absolutely gorgeous, like the colors, architectural features, rugs, art-work, lighting and many of the furniture choices, I'm not feeling it all coming together.. I hate that mobile in this classical room. Its like a giant albatross looming over his lovely sitting areas. The master of eclectic classic design, IMO, is still Vicente Wolf. With pinterest, tumblr, facebook and instagram, we are bombarded day after day with image after image. Mr. Sills work, however, is different. It is exceptional. It is art. I was not aware of his work and did not know about his book, but I have placed my order. Just discovered Stephen Sills on vacation. You know, the pile of unread magazines taken to read. Aside from being a fellow SMU grad, he is also a skilled garden designer. Posted a couple of his gardens recently, http://taradillard.blogspot.com/2013/10/stephen-sills-on-acquiring-objects.html. Love the pics you chose. Sills made my day in Jamaica ! I love Steven's work, and I love the book! Such a nice post, Holly. Don't make me choose but I'd sure like to hang in the magical house. I adore Stevens work, Holly, and I love the book! I cannot wait to see this book. His first book with James Huniford was one of my first interiors books and when I flipped through it, I got a massive lesson in CLASS and good taste. I was never the same after...so I cannot wait to lay my paws on this.